For today’s special club meeting, we gathered on jokaydiaGRID and then made an immediate journey as a group to FrancoGrid. 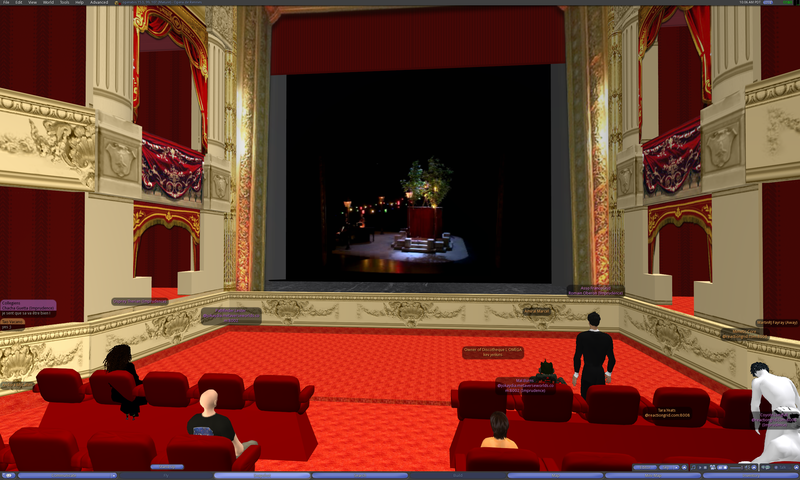 The Opera featured a video stream of a live performance of the Real Life Opera of Rennes, as well as an opportunity to speak with the artists after the opera. 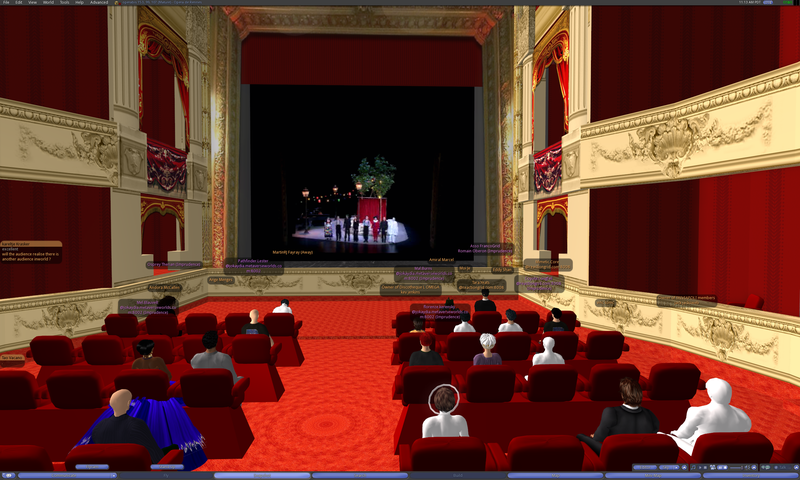 This mixed-reality event was organized by project OperaBis and Bibliothèque Francophone du Metaverse as a way to internationally share French culture in virtual worlds. Additional performances will be happening in the coming weeks, so if you missed this one please stay tuned to OperaBis for information about future performances! You can also follow @metopen and @Hugobiwan on Twitter to keep updated on the many events happening on FrancoGrid. We begin on the region Pathlandia in jokaydiaGRID. Pathfinder Lester: yeah, i was thinking of wearing a tux. but I think I’ll just wear my #HGAC T-shirt to help raise awareness of our club. Pathfinder Lester: i just got back from testing the jumps, and they all work. so we should be good. Balder Carousel: What kind of Opera is this? Pathfinder Lester: Balder, there are portals around. Pathfinder Lester: I have 2 portals on this region. 1 takes you to ReactionGrid instantly. The other takes you to MetaverseNexus grid. We’ll be using the latter one today. Balder Carousel: anyone to osg? Pathfinder Lester: Mal, my portals are copyable, so you could grab one and even edit the script to paste in any Hypergrid address you want. Just be sure to reset the scripts. Tara.Yeats: yes, definitely want to pick up a copy of your portal script, Path! Pathfinder Lester: OSGrid is currentlly running version 1.5 of the HypeGrid protocol, and this grid is running 1.0. so can’t jump directly right now. Pathfinder Lester: the gate I just rezzed should be full copy. feel free to grab a copy. Pathfinder Lester: Coyote, yes. i’m going to wear my #HGAC T shirt tho. i want to raise more awareness of our club. 🙂 so I’m going casual. Pathfinder Lester: Coyote, oh that’s a good idea! Pathfinder Lester: here, i just made a cube with a hovertext script. When we arrive on FrancoGrid, we will be making a regular teleport to the region “operabis.” Open your World map, search for “operabis,” and teleport. That’s where the opera will held. Pathfinder Lester: ok, pls walk thru this portal. Jadyn Firehawk: ok here goes! 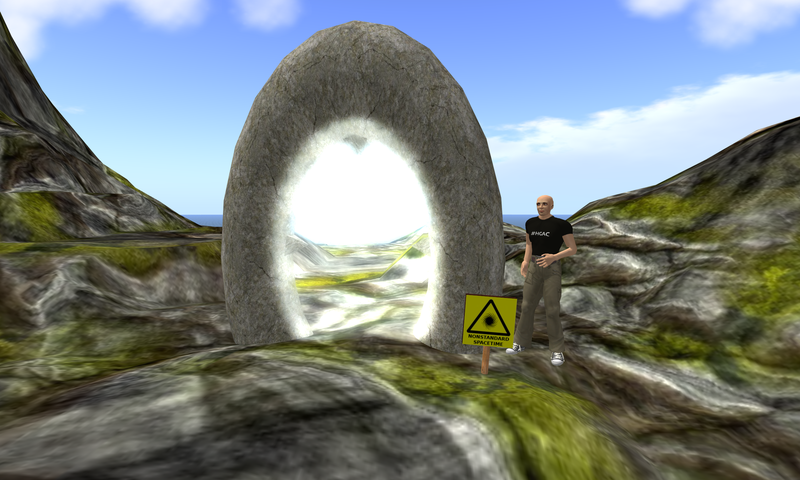 The group walks through the instant Hypergate portal on Pathlandia on jokaydiaGRID. And we arrive on MetaverseNexus Grid. Jadyn.Firehawk: what grid are we on now? Pathfinder.Lester: In the text box next to the Search button, enter the Hypergrid Address. Pathfinder.Lester: Click the Search button and wait for the map to move to the jump region. Pathfinder.Lester: then click Teleport button. 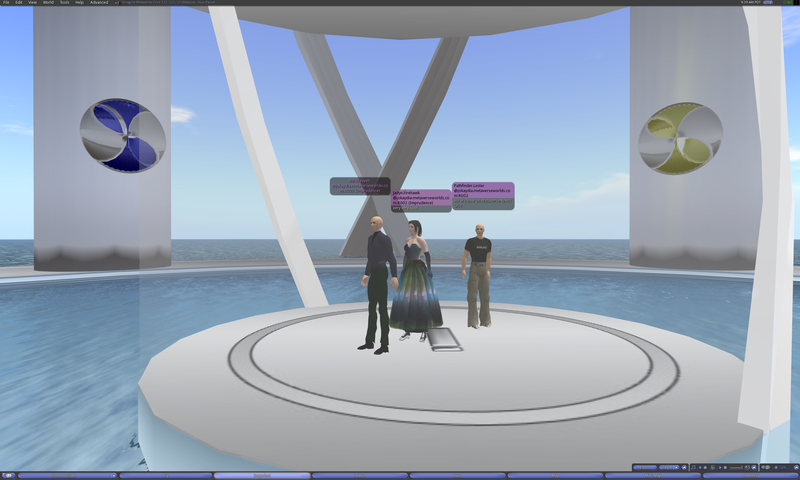 The group makes a Hypergrid jump from MetaverseNexus Grid and arrives on FrancoGrid. The group makes a regular teleport to the region operbis. Pathfinder.Lester: Tout le monde porte des vêtements magnifiques, aussi! Jadyn.Firehawk: Je peux parler français maintenant, wow! Chacha Guetta: a je suis bloquet ! Jadyn.Firehawk: comment voulez-vous dire «merci, Google,” en français? Pathfinder.Lester: J’entends le public dans RL. Jadyn.Firehawk: i hear audience murmer sounds now, is that correct? kareltje Krasker: video is still drapes fro me. will be be able to see the RL audience too ? The curtain goes up, and the Opera begins! Pathfinder.Lester: Vidéo et audio sont bons pour moi. The singer has a beautiful voice! Pathfinder.Lester: Le chanteur a une voix magnifique! The play was beautiful. We could hear and see the performers via the live video, and it was so much fun to follow the local chat conversations in french. I counted 26 avatars in the audience. 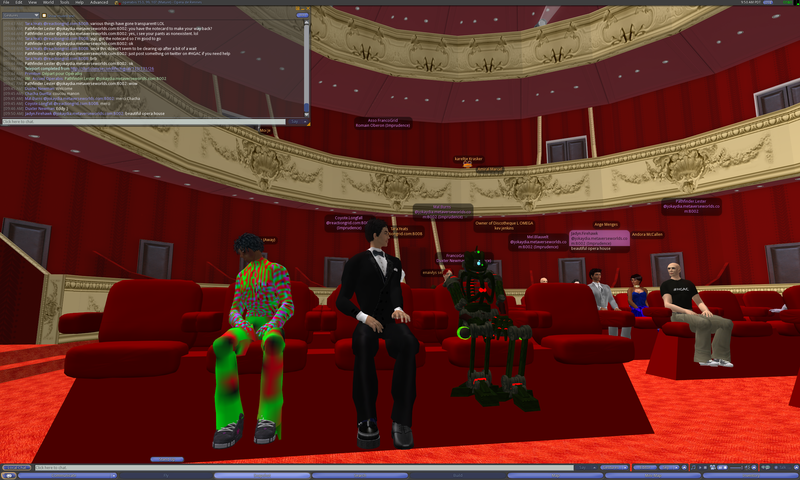 10 of us were logged in via the Hypergrid, and everything went smoothly. The server lagged a little bit (chat lag, mostly) but remained stable for the entire hour and a half of the performance. Great work on the part of the technical support team keeping things running smoothly! I also spotted reynald raidegrave sitting in the audience, the musician who we got to see performing a live rock show last week. Very handsomely dressed in a tux. And check out his fabulous shoes! gill beaumont: on aurai du mettre l opera sur un autre server..
fabrice parisi: i hope our HGAC friend take good moment ? Time flew by. The performance drew to a close, and all the artists came on stage to bow to the audience. The crowd applauded enthusiastically. 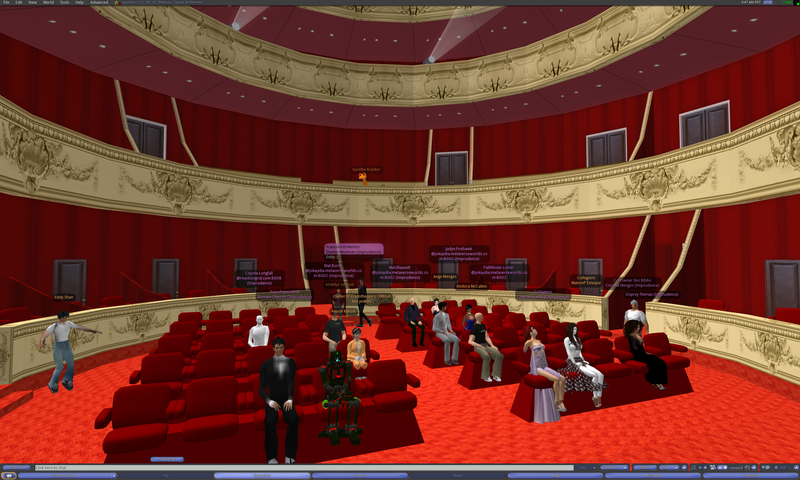 And after the performance, the real life performers chatted via voice and text with us in the virtual audience. This was a perfect example of how to host a successful mixed reality event. 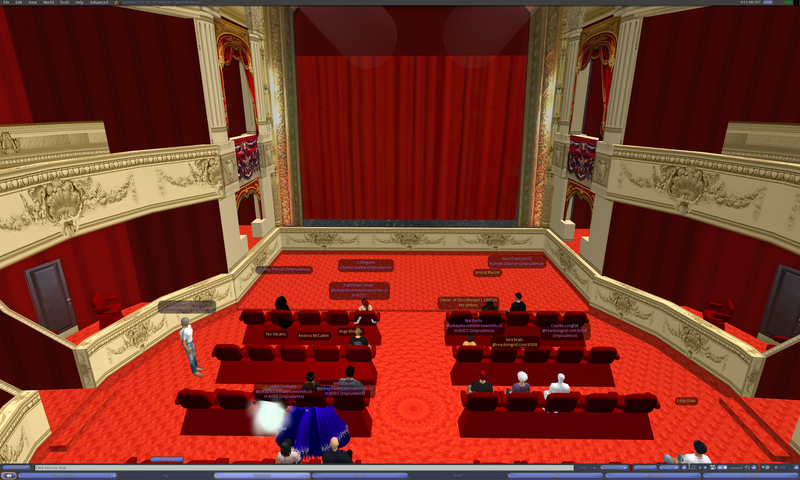 And look below in the chat log to see where everyone in the audience came from. All over the world. A truly international event to celebrate French culture! Pathfinder.Lester: Une belle production. Merci, les artistes! Mimetic.Core: This was fantastic. I’m happy to have experienced it. Pathfinder.Lester: I would like the artists to know that there were people around the world who enjoyed their performance. I am in Boston, US. Pathfinder.Lester: Je voudrais les artistes de savoir qu’il y avait des gens partout dans le monde qui ont apprécié leur performance. Je suis à Boston, États-Unis. Tao Vacano: voila pascale je te vois ? Pathfinder.Lester: Amazing. Tant de gens de partout dans le monde qui jouissent de cette performance. ssm2017 Binder: peut etre pouvez vous parler dans le stream et nous on repond au clavier non ? Pathfinder.Lester: J’espère qu’il y aura plus d’opéras de ce genre dans l’avenir. Pathfinder.Lester: Je tiens à remercier tous ceux qui ont rendu cet événement possible. Tout le travail technique. Merci beaucoup! ssm2017 Binder: quelqu’un a vu mon adaptateur dmx 5/3 ? Pathfinder.Lester: Je dois y aller aussi. Merci pour ce grand événement. Bonne soirée! To everyone who was involved in organizing this event, thank you! And remember, additional performances will be happening in the coming weeks, so if you missed this one please stay tuned to OperaBis for information about future performances! 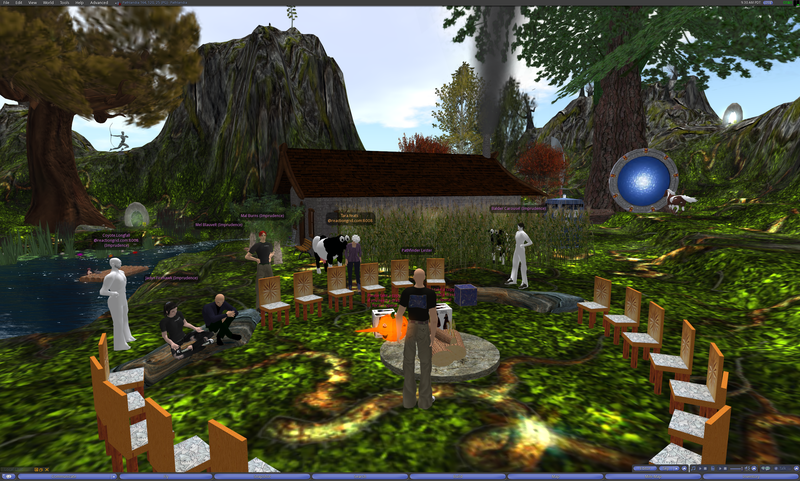 So ends another excursion of the Hypergrid Adventurers Club! 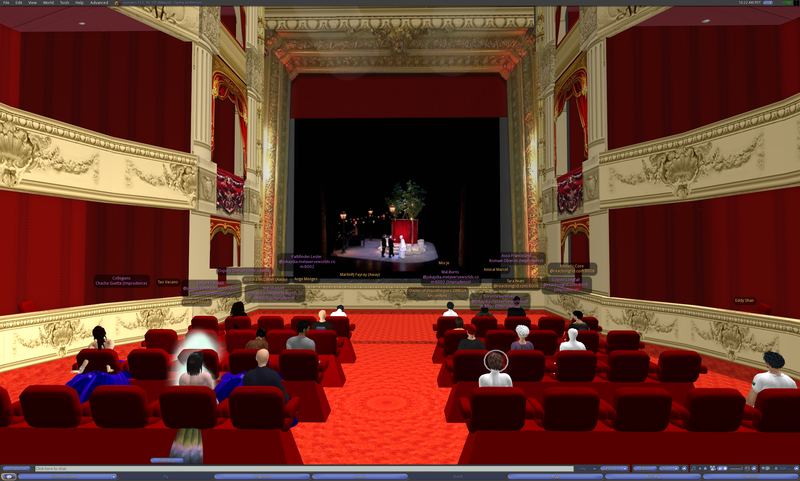 ADDENDUM: Sel Marin wrote a nice summary of the Opera, including some video of the inworld event and a Google StreetView of the real life opera house in Rennes, France. 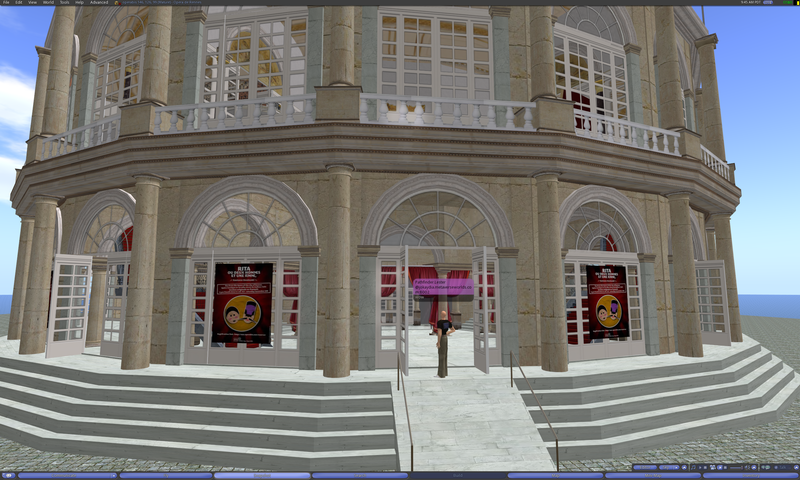 Hugobiwan Zolnir wrote about the process of recreating the real life opera house on FrancoGrid. And here is a detailed overview of the entire production by Opérabis. This entry was posted in Art, Avatars, Hypergrid Adventurers Club, OpenSim, Virtual Worlds and tagged "live music", art, avatars, francogrid, HyperGate, HyperGrid, Hypergrid Adventurers Club, jokaydiagrid, metaverse, online communities, OpenSim, virtual worlds by John "Pathfinder" Lester. Bookmark the permalink.